Kale is the newest super food to make waves in the fitness industry and health freaks everywhere are stuffing it in to their diets as fast as they can. All varieties of kale are high in manganese, as well as vitamins C, K and A, making this vegetable a force to be reckoned with. I use kale in smoothies, egg skillet bakes, and most recently in raw salads as the leafy green of choice. Don’t let its rough exterior fool you. You can soften kale with just a loving touch. Massaging raw kale with a little bit of oil and salt brings out its tender side and takes away any bitterness that might linger on your palette. 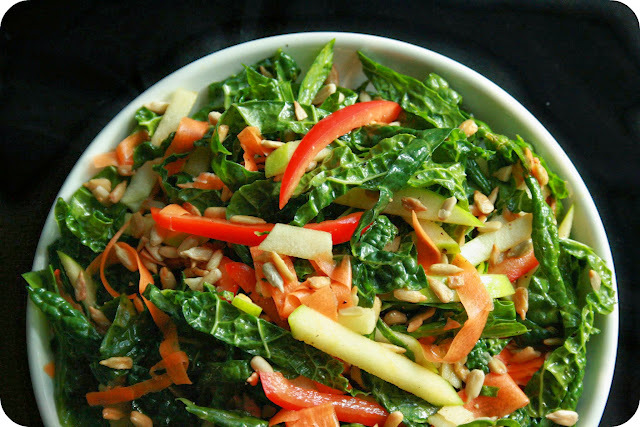 Make this Rainbow Kale Salad with Avocado Oil Vinaigrette and you might just save this super food from being thrown in to yet another pot of boiling water. Not that those hammy, salty, boiled greens don’t have a place in my heart (especially next to fried chicken). In a large bowl toss kale with one tablespoon of avocado oil and a liberal pinch of salt. With your hands gently massage the kale in the oil and salt until it softens. When the kale is thoroughly massaged (it should look slightly wilted and shrink in bulk by half) toss with bell pepper, apple (toss in lemon juice to inhibit browning), and ¾ cup of the sunflower seeds. Set aside. In a blender or food processor whisk all of the vinaigrette ingredients until combined. toss the salad with the vinaigrette immediately before serving. To plate, top single portions with a small handful of sunflower seeds. Great as a light lunch! If you keep the dressing separate this can be made 2 days ahead. I absolutely love kale. I use it in my morning smoothies, in salads and in sautes. This looks great! What a gorgeous salad!!! And I love the idea of an avocado vinaigrette...so yummy! Of all the myriad greens that we have here in Thailand, I have yet to see kale - at least the kind that we have in the States. This salad is so gorgeous though...I'll have to try it with some other kale-like green! It looks and sounds healthy and delicious! I love the colors in this salad! And the dressing sounds awesome! I am almost embarrassed to say I haven't found any kale around here that wasn't so bitter I couldn't get it down. I know it's good for me but at my house, it if doesn't taste good, it doesn't last. It certainly happens. Kale can get very bitter if it is grown in the heat. I'm growing my dino kale indoors with great success! This is a perfect salad. I really want to try the avocado oil too, I haven't seen it yet. Funny how the kale softens up when you massage it. I have used fresh avocado and massaged that into the kale. Love this stuff and your recipe. Hi Suzi! Avocado oil is such a treat. I found mine at a local organic market. In fact, that reminds me I am almost out and need to buy some more. What an interesting technique to massage the kale to soften it--kale is one of my favorite veggies, but it does tend to start out tough. This looks fabulous and colorful. I'm so glad I found your post. I always avoid raw kale and had no idea that massaging it takes out the bitterness! I will have to try that. Your salad sounds delicious and so healthy. This year I discovered kale and I love how you made salad with it! I gotta find avocado oil! Love this salad! It is so beautifully colored and so nutritious! I am in love with both avocadoes and kale so this is perfect!